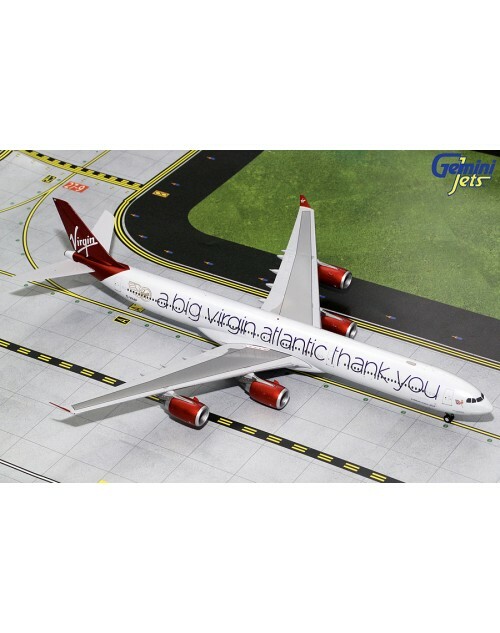 1/200 scale Highly detailed Die cast Gemini Jets virgin Atlantic Airbus A340-642 with current color scheme and "A Big Thank You" titles. Registration: G-VNAP "Sleeping Beauty Rejuvenated", msn: 622. Item No: G2VIR732. Released in August 2018. Stand included. Dimensions: Length: 14 1/2 inches (37 cms), wing span: 12 3/8 inches (31.5 cms).